Bicycle riding is a great way to spend time together as a family or a way to get a great workout while spending time outside. Across Long Island there are some great trails whether your preferences lean to off-road, path, or street biking. All throughout Nassau and Suffolk Counties, there are biking clubs that get together every week for rides of different distances and skill levels. If you want to ride a few miles through the neighborhood or tackle a Century, you can find the ride that is right for you. When you ride a bike, you are taking on a responsibility similar to that of someone who is driving a car. A bike, after all, is not a toy, and one is required to obey the rules of the road. If you are our riding with your family, you also have to be aware of the people and cars around you as well as around those with you. Bike safety is very important when you head out for a ride. This includes the basics such as wearing helmets and pads regardless of your age and skill level. A fall from a bike can cause a serious injury if you hit your head, a knee or an elbow. 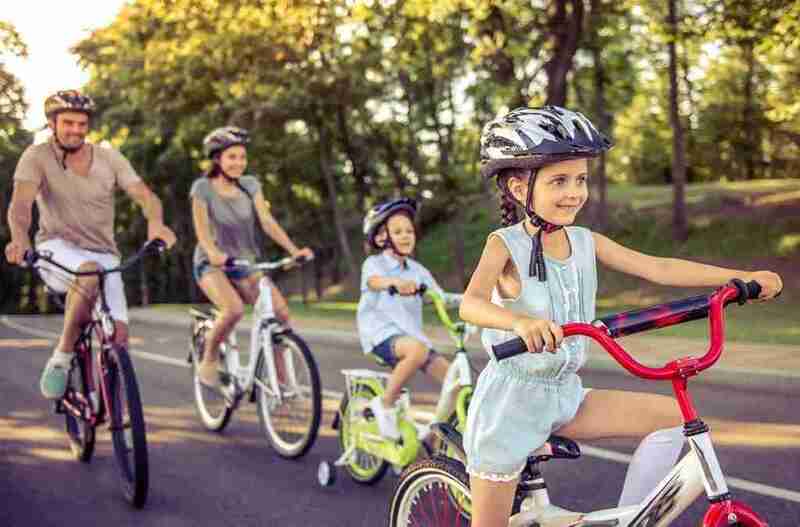 New York law requires anyone 14 or under to wear a helmet; if you’re older than 14, you should also wear a helmet to protect your head and brain. When riding, especially with kids, it is always best to ride either on sidewalks or on bike paths that are closed to cars. If you decide to ride on the street, if you are with kids, or even other adults, make sure your whole group has a skill level to safely ride together. Also, if you are in a group, it is a good idea to assign an order in case you have to line up single-file at any point, so kids aren’t trying to jockey for position. Communication amongst riders about road defects, pedestrians and other cars can also be key to a safe and enjoyable ride. Regardless of the age of the rider, the rules of the road need to be followed and respected. We may take different signs and lights for granted, but do not assume kids know what a Yield, or even a Stop sign means. Same for different lights, whether they are traffic lights, or flashing yellow or red lights as are seen outside of fire houses. When riding on a street, even for short distances, all riders should be wearing bright clothes and should have reflectors on the wheels of the bike as well as on the front and back of the bike. Reflectors on bikes should also follow the same color schemes as lights as reflectors on cars: Red in the back, white in the front and either red or yellow from sides on the wheels. Using flashing lights—during day and/or night will make you visible to other bikers and motorists. Wearing reflective clothing will enhance your visibility to others. Do not make any sudden moves when around other riders or on a street with cars and trucks. Use hand signals to let people around you know where you are going. While bikers are required must follow the rules of the road, if you’re injured in an accident with another vehicle you’re considered to be a pedestrian! As a pedestrian, the vehicle which struck you will be responsible for providing No-Fault benefits to you—medical and lost wages payments, etc…. Bike riding is a great exercise and a fun family activity. Even if you follow all of the proper safety rules, there are still times when accidents happen. If you are hurt while riding your bike, get immediate appropriate medical attention, then call the law office of Elan Wurtzel at 516-822-7866 for a free consultation to learn about your rights after being injured.